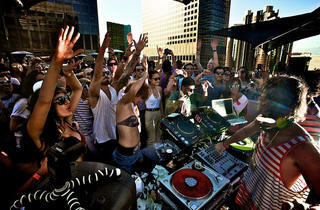 The Droog DJs are known for throwing intimate, 250-people parties on the Standard Rooftop. And this year, their Culprit series (in its sixth season) is about to become even more intimate, as the number of parties thrown will be less frequent. It’s not that culprit co-founders Andrei Osyka, Brett Griffin and Justin Sloe are shying away from their mission to bring internationally acclaimed talent to music lovers in the know (look for acts like Benoit + Sergio, Jamie Jones and Lee Foss and DJ Tennis this year, along with up-and-comers like Mano LeTough, Adriatique and PBR Streetgang), but their own touring schedule has blown up to a point where they simply aren’t in LA as much, hindering the number of parties they can throw. No matter how big they get, the trio has its roots firmly planted in creating parties for dance purists. And the talent they attract are just as hyped: Last year, when favorites Benoit + Sergio played the rooftop venue Benj Meyers (aka Sergio) was so in the zone that a security guard saved him from nearly teetering to the edge of the roof while performing.